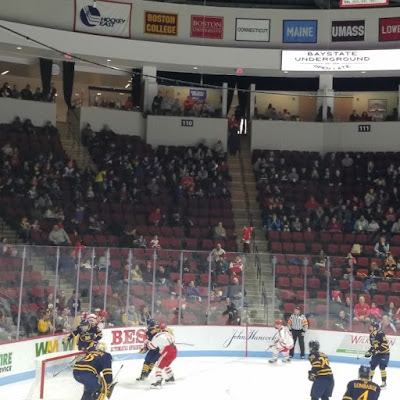 After four attempts Quinnipiac has picked up its first ever win over traditional national power Boston University with a 4-3 win on a snowy late afternoon Saturday at Agganis Arena in Boston, Massachusetts. Instead of a traditional recap here are my thoughts and observations from this game. - Quinnipiac came to play against a team that on paper has much more high end talent with 12 NHL draft picks including four in the first round alone. Credit to Rand Pecknold and his coaching staff in preparing them well this past week after a tough loss to Harvard. - The Bobcats did a great job starting fast again with two goals in the first 13 minutes of the game. They really controlled the first period before Boston University got on the board via a Patrick Curry goal and a brutal defensive zone turnover via a drop pass on the Quinnipiac power play paved the way for Ty Amonte's shorthanded goal to tie the game. It was a lazy drop pass and frankly not something I would do against a team as talented as Boston University. - Brandon Fortunato got his redemption. The former Terrrier defenseman who had 40 points in two seasons on Commonwealth Avenue stuck the dagger right through the hearts of Terrier fans when he scored the game winning goal with 2.5 seconds left on the clock. Fortunato also added the Bobcats second goal of the game on a shot through traffic at the point and had the secondary assist on Daniel Winslow's goal in the second period. Fortunato has been one of the Bobcats best players this season and has set a personal season high with 23 points so far this season. Since the calendar turned to 2019 he also has eight points in five games. - It's really shocking to see a team as talented as Boston University have a losing record at this point in the season with an 8-9-3 record. While I expect them to likely go on a run, they really did not come out strong against Quinnipiac falling behind early. While we know Albie O'Connell can recruit, I think the jury is still out on him as a head coach. - The Quinnipiac power play was 0 for 5 against the Terriers and I thought their were times they just passed way too much. Put some shots on net and get traffic in front and good things usually happen. They were trying to always look for that perfect shot and sometimes you just need to shoot the puck. The Terrier power play was not a factor either as they went 0 for 6 in the game. Credit to both teams defenses for not allowing man advantage goals. - Jake Oettinger was huge for Boston University in net last night with 40 saves. Without him I think this game would have been a blowout for Quinnipiac. He was that important to keeping the Terriers in this game with many key saves. The first goal he gave up to Desi Burgart was soft as Charmain toilet paper when Burgart slipped one short side. - Andrew Shortridge also stood out for Quinnipiac and showed that he is the clear number one in my opinion for this team. He made 31 saves and really made some key ones at critical points in the game. I don't think he can be blamed for any of the goals in this game. The first goal was good puck movement by the Terriers while the second goal was off a terrible turnover by the Bobcats in their own end while the third goal was a snipe by Shane Bowers from in close. He isn't going to miss that shot with his ability. This is the fourth straight start for the junior goaltender and he should see the majority of the bigger games against the best teams down the stretch. - Peter Diliberatore continues to impress me as a freshman. He made the rare jump from the prep ranks to NCAA hockey which is not done very often and the transition has been pretty seamless. His ability to carry the puck from his own end to the offensive zone is impressive along with being trusted as a freshman on the the team's second power play unit. He already is a plus 11 for the season with 11 points in 23 games. - The Quinnipiac freshman class continues to rack up the points as they accounted for six of the twelve points on the night from Bobcat players. So far this season they have accounted for 78 of the 230 points which is 33% of the Quinnipiac offense. - This was a chippy game at times with 17 penalties assessed between the two teams and I was not impressed with the Hockey East officials at times especially when Quinnipiac freshman Wyatt Bongiovanni was cross checked to the ice in front of the net and was the one sent off for a roughing call when the Bobcats were on a power play.